Jacob Des is going to be working at No Ka Oi in Philadelphia December 6th-10th. 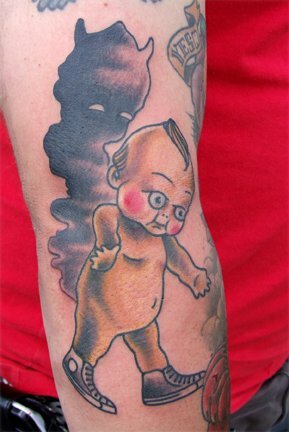 He did this really disturbing Kewpie tattoo (It’s the shoes that make it creepy) but is available for all of your non-creepy related tattoo needs while in the city of Brotherly Love. You can contact him through his Facebook page or his handy-dandy blog for appointments.